Plus, more on ‘House of X’ and ‘Powers of X’! Jordan: Hey there, X-Fans! I am sure you rushed over to this article this week wanting to hear more about the newly announced HOUSE OF X and POWERS OF X mini-series written by Jonathan Hickman! The catch is that since the questions I am answering this week were submitted last week, before the announcement, they are not questions about this 12-part weekly revolution we’ve been cooking for the last year or so. Suffice it to say that it’s going to be epic. A few months back, a fan pointed out to me that as of 2019, we’re as far from the Claremont/Lee X-Men #1 as that issue was from the Lee/Kirby X-Men #1. I was excited to hear that, because I think HOX & POX, as I lovingly refer to them, are worthy of taking that baton and running with it for the next 28 years. Anyway–we released an incredible Mark Brooks piece he did for the promotion of these books at C2E2. I’m sure it’s right on this very webpage mere inches away from these words. There’s a lot of crazy stuff in that piece. So, for next week, why don’t we focus on questions and theories about that bad boy? Sound good? With the Uncanny X-Men: X-Men Disassembled collection now on sale, it seems like the perfect time to ask wes empurrado pela máfia X’s (@nvtegrey)‏ question. Did you achieve what you hoped for with “X-Men Disassembled” or do you have any regrets? Jordan: Overall, I am very happy with the way “X-Men Disassembled” came out. I think there is some super fun stuff in there, and the writers and artists both did an awesome job. I’ve wanted to work on a big weekly comic series for a long time and it was super challenging, but we pulled it off. There were weeks where, because of the holidays, we had to send two issues to press at the same time… but we made it through all 10 issues (two oversized) on time, and I am super proud of that fact. Thanks to Chris Robinson, who kept things moving as the assistant editor on the series as well. As for regrets… I think “regret” is too strong a word for it. There are two things to do with it that I don’t think went ideally, but it’s still too early to say what they are as they are connected to things still happening! Ask me in a year or two. AiPT! : I’ll set a calendar reminder. Speaking of Uncanny X-Men, Zack Jenkins over at Xavier Files‏ (@XavierFiles) wanted to know what inspired the choice to bring back Cyclops’ ’90s costume and Wolverine’s ’80s look? Jordan: We just like them? Matt came up with the gag of them having to use leftover costumes scrounged from old storage since the mansion was destroyed. We just picked the ones we wanted to see them in. Wolverine’s been wearing a variation of his blue and yellow costume for a long time now, I know I for one very much missed the brown one. I think it was Matt’s suggestion that Cyclops be in the ’90s costume, but I could be mistaken. Salva requested we put Havok in the costume he had designed for him. All three seemed doable, given the premise, so we rolled with it. They certainly won’t be in them forever. AiPT! : And while we’re on the topic of X-costumes, Perilous Siege asked if there’s a specific reason Dani, Kitty and Karma tend to stick to the training uniform aesthetic and could this all change as the new Uncanny X-Men gather their bearings? Jordan: Because when people think of them in their iconic looks, them in the generic training uniform is the one that made the biggest impact. That was their most memorable look, unfortunately. Kitty, for example… she’s has a bunch of costumes. I think the only contender for one that people really look back on fondly is the blue costume from early Excalibur… and that one is pretty dated. As much as I truly adore every Excalibur issue where she is wearing that outfit, if we put her in that now… those padded shoulders, those super baggy sleeves… they are very of their time. As a result, I think when people try to go “back to basics” with her, they put her in the black and yellow. Same with the New Mutants, as they were in those uniforms for some of their biggest stories that people love. Will that change? Yeah, I hope so. Hopefully, we can come up with new costumes at some point in the future that become the new standard for those characters. There a lot of X-Men who have lots of looks. Cyclops, for example–as we discussed last week, there isn’t a consensus on what his best costume is. The Neal Adams look, the Simonson look, the Jim Lee look, the Quitely look, the Bachalo look–they are all pretty great, and extremely well remembered. I’d love it if we can get some new costumes for these three that people love that much. AiPT! : I know you like your Longshot, Jordan, so maybe you have an answer for KevinRanch (@KevinRanch1) who asked how long until Longshot is on a main X-Men team again? Jordan: I am sad to say I don’t think it’s very likely. I really do love him, though. He’s not a mutant, you know. AiPT! : On the topic of missing X-characters, Trent Seely‏ (@InstaTrent) said the biggest question mark of the X-Men has always been Doop. Right now he’s wondering where he is. The Age of X-Man? The 616? Jordan… have you seen Doop? Jordan: Doop’s definitely in the 616. I’ve seen him. I’m sure you will, too. AiPT! : Wait… is that a casket behind that crying Doop? Cue the X-Fan theories! OK, so Marvel has been very focused on bringing back past creators for Marvel’s 80th anniversary. So, Purplevit‏ (@Purplevit13) wanted to know if there are any hopes of former X-Writer Fabian Nicieza making a return. Jordan: I’ve enjoyed working with Fabian in the past (on Deadpool & Cable: Split Second), so it’s certainly possible, but I have nothing I can announce right now. AiPT! : Sina Grace recently wrapped his Iceman run in Uncanny X-Men: Winter’s End. Al.Dondo‏ (@al_dondo) asked if there’s any chance we could see more LGBTQ characters like Christian Frost, nuPyro or Darkveil in Uncanny X-Men or another future book. Jordan: You will definitely continue to see LGBTQ characters going forward. Whether it’s those particular characters remains to be seen. AiPT! : So Jordan, I’m not sure if you’re aware, but people have strong opinions about Scott Summers. Kevin Ong (@Avatarkyungsoo) wanted to know why people gave Cyclops so much flack for killing Xavier under the influence of the Phoenix Force while Wolverine is basically a mass-murderer–and even killed Northstar before–but no one, not even the Avengers, bat an eye. Jordan: I don’t think I agree with the premise. Yes, Logan killed Northstar and a TON of other people… but it was when he was brainwashed by the Hand. The Beast is a highly malevolent entity/force whatever, and corrupts everything it touches. Other times, Logan was brainwashed by government agencies or corporations. In addition, I think people have batted a lot of eyes at him in the past, it’s just that he’s proven himself a lot since then. Cyclops was, it’s true, the host to the Phoenix Force at the time… but it’s very unclear what that means. At times, the Phoenix has been a corrupting force, but at other times it’s not–sometimes it just gives the bearer power. And if that’s the case, it’s not so much that the Phoenix makes the person into something darker, it’s that who the person is is someone who would go dark and do worse things given that power. I cannot say for certain which interpretation is CORRECT, but that is why people give Cyclops guff for killing his father figure and mentor–they believe the Phoenix doesn’t change who you are, it reveals who you are when you’re unstoppable. AiPT! : Grey_life12 (@304grey_fan) is a fan of Scott–and Jean! Any chance we’ll see Jean and Scott have a meaningful chat now that both are alive? Grey_life12 has waited so long for their reunion, Jordan. Jordan: They’re not even in the same universe! As far as Scott is aware, Jean is dead. Even IF Jean comes back, who says Scott will still be alive by then? AiPT! : Finally, we received A LOT of questions about a Storm solo title, possibly by Ta-Nehisi Coates and Jen Bartel. So, any news to share for Maurice (@MootyMaurice), Queen Drea (@gamer_chic434), Butterflykyss (@butterflykyss) and all of Ororo’s other eager fans? Jordan: From what I can tell, this traces back to the two of them saying this was something they were interested in doing at some point… but in the time I have been the X-Men editor, there has been no discussion of this series happening. I know they are both busy people, though. There are no plans for this to happen right now, but it’s worth talking about at some point if it seems feasible. AiPT! : Before we wrap up this week’s X-Men Monday, I wanted to ask… Jordan, if you could turn any real-life person–a celebrity, an artist, a politician… anybody–into a mutant and have them join the X-Men, who would it be and why? Jordan: I think I gotta give it to Hugh Jackman. He’s earned it–he was great in Les Mis. AiPT! : Good pick! I hear Hugh’s also a great showman… dare I say the greatest! Finally, it’s officially spring! What one song should X-Fans listen to this week to get them in the spring spirit? AiPT! : Make way for the homo superior, indeed! You just know Magneto listens to this Bowie track to pump him up before battles with the X-Men. Anyway, thanks for stopping by Jordan and a big thank you to all the X-Fans who submitted questions! 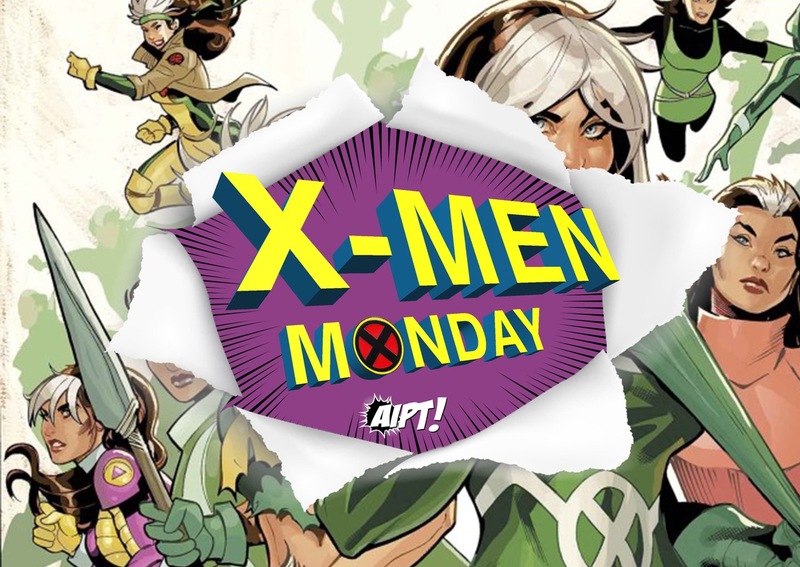 Remember, we’re switching it up for next week’s edition of X-Men Monday. Jordan wants you to submit whatever questions you have about that C2E2 X-Announcement–so post them in the comment space below or look for our call for questions on AiPT!’s Twitter page tomorrow morning. Have a great week, X-Fans and see you next Monday! Oh, anything to add, Hugh? Pfft, more like the Greatest Show-Off.